Showcased in highly polished oval links of 18 Karat white gold are 1.00 Carat t.w. dazzling brilliant round cut pave Diamonds. This exquisite design features graduated links from 14.8mm at the center to 8.1mm behind to create a stunning display of fire and shine, that is simply crave-worthy. Finished with a bright polish, each link connects atop one another for a unique 3-dimensional effect. Measuring 7 inches this piece secures with a fold-over clasp. 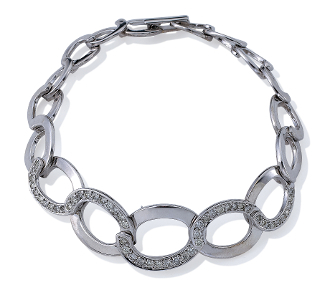 Daring and dramatic, this Diamond lined oval link bracelet will make a fashion forward statement, day or night!